Creative people often have creative friends. 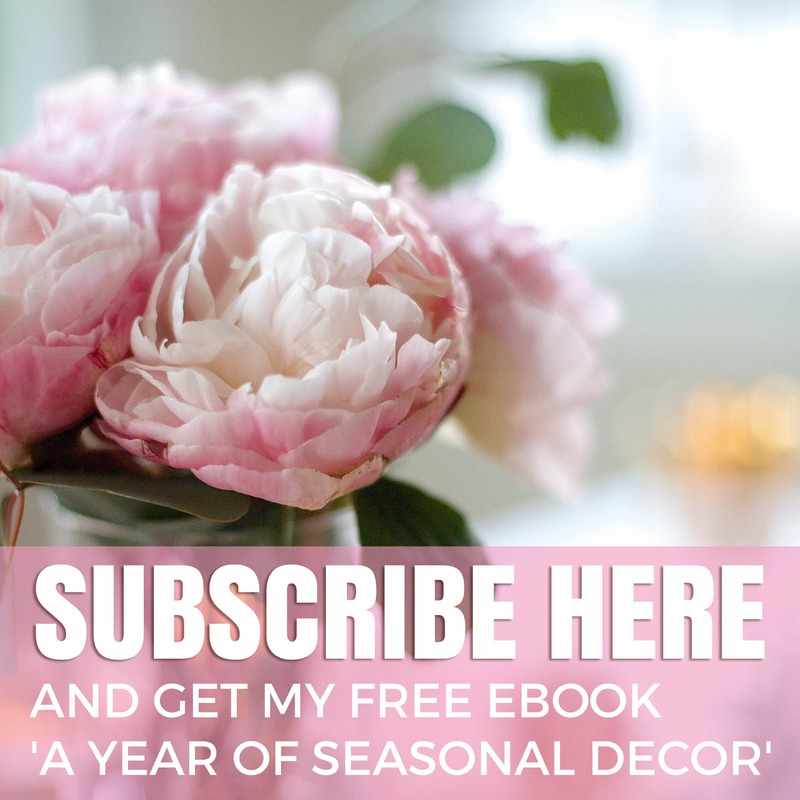 I am delighted to be blessed with quite a few, and so when my friend Cathy asked me to help her style and set up the decor for an event she was hosting, I jumped at the chance. 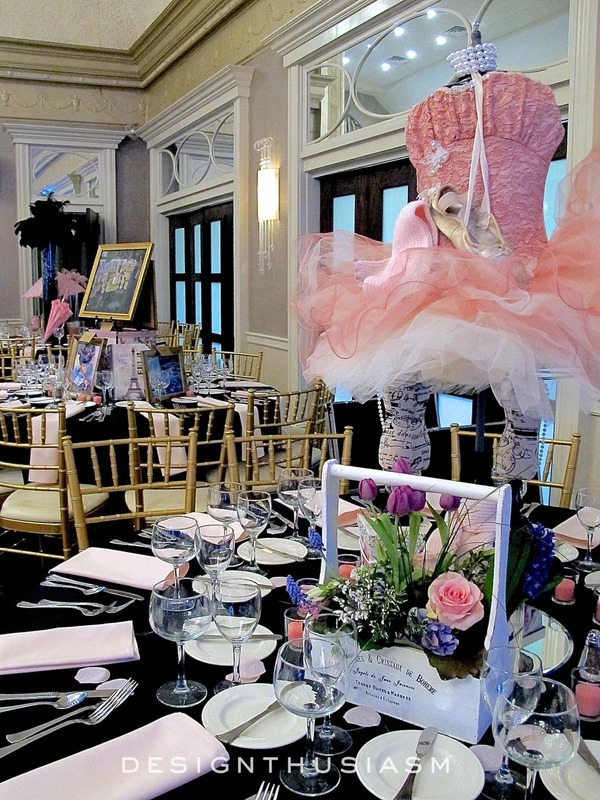 To be clear, the concept and designs were all hers, but it was a joy to give my input and energy to creating a ballroom full of April in Paris centerpieces. The event was a business gathering, yet the decor was all pleasure. 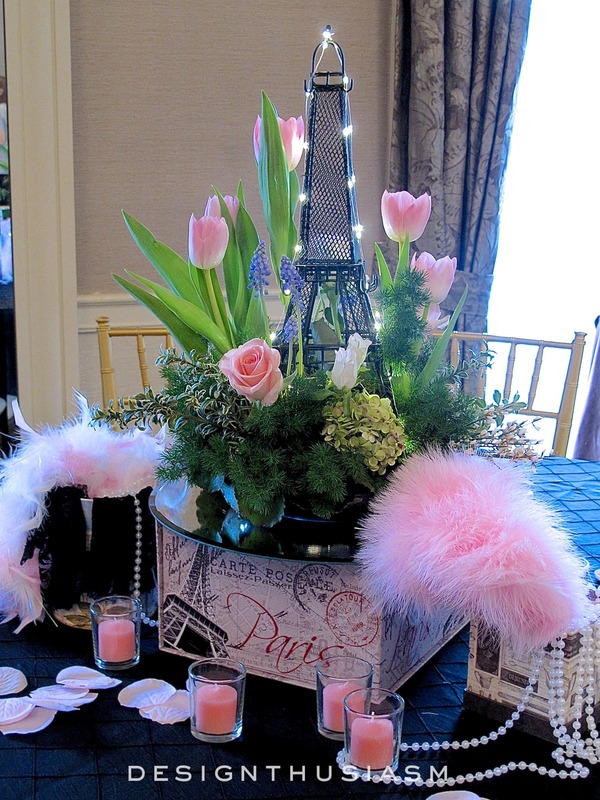 Given the time of year, Cathy settled on an April in Paris theme and each of the tables was dressed in a different concept, all relating to the selected theme and all put together by our little DIY team. Since there are many pictures covered in this post, I’ll be brief in my descriptions, but feel free to ask any questions in the comments below if you’d like more information on how any of the centerpieces were created. 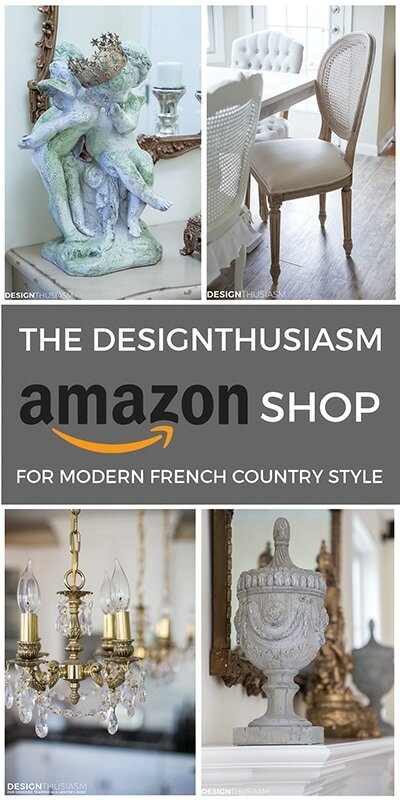 One of our favorite concepts revolved around whimsical French costumes presented on mannequin forms. The French maid above was festive and frilly, sporting pearls and feathers and accessorized with a lace parasol and festooned mask. 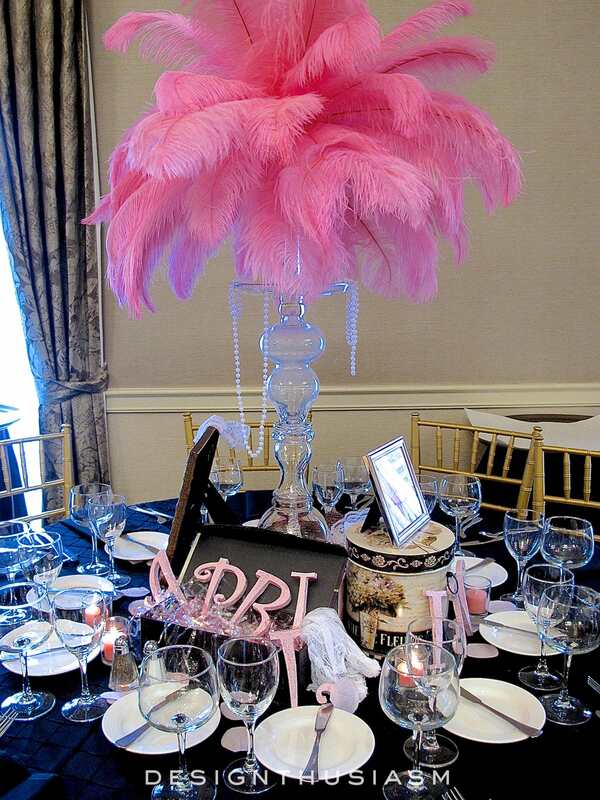 Most of the tables were peppered with faux petals and pink votives, some strewn with pearls and feathered fans. French boxes were everywhere, used for height or to drape decor over the edges. 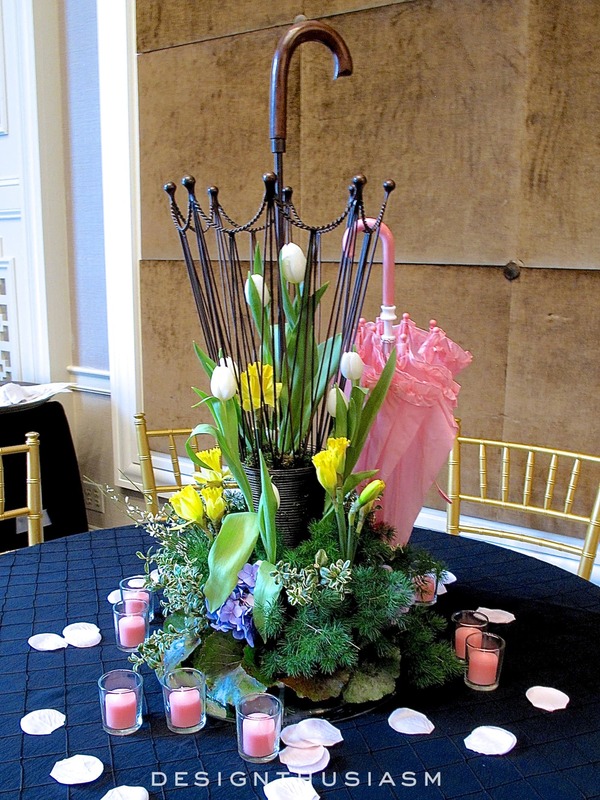 Some of the tables were graced primarily with flowers, but each with its own unique concept. 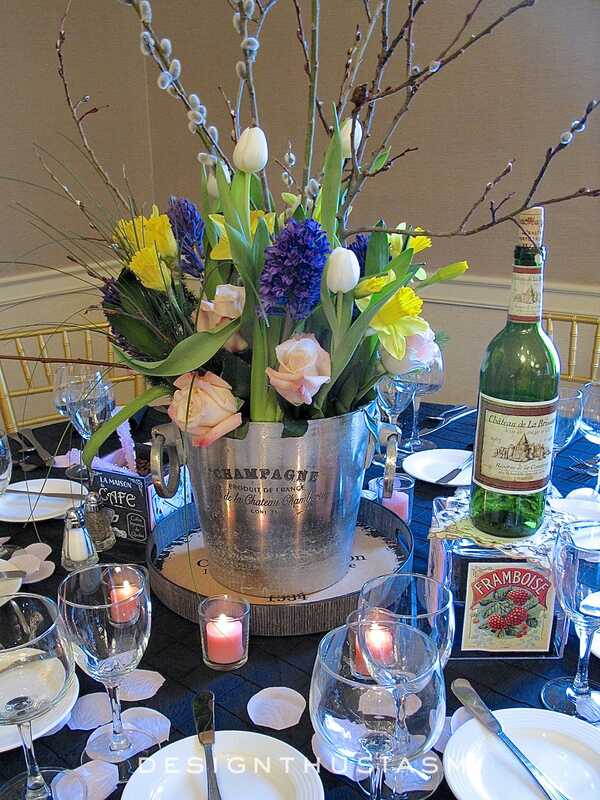 The champagne bucket above serves as a vase and is set upon a circular wine tray, surrounded by other adornments. No Paris theme is complete without an Eiffel Tower (we actually had several) and the wine rack above displays bottles of wine with French labels applied. 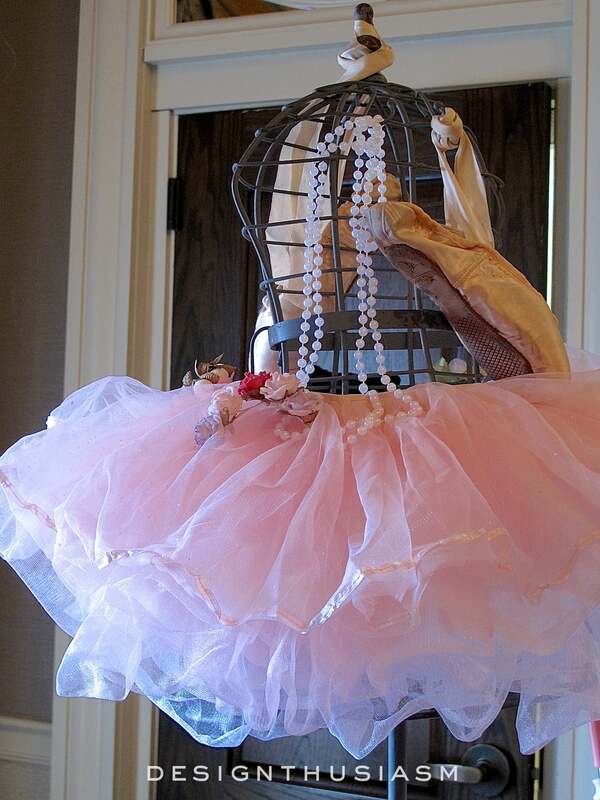 In addition to the felt mannequins, we used wire bodied ones, as well, here attired in a ballet theme, with tulle tutu and draped ballet slippers. Another piece that channels both Paris and springtime is the floral embellished wire umbrella stand, with ruffled parasol, votives and petals. 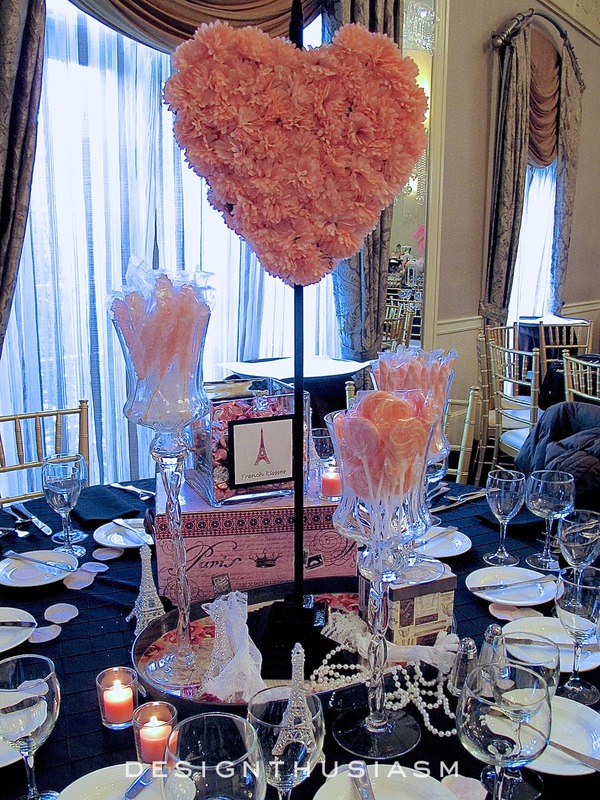 Several people chose the table above as their favorite of the collection, with a lovely pink flowered heart and a selection of pink candies offered in wonderful glass holders. 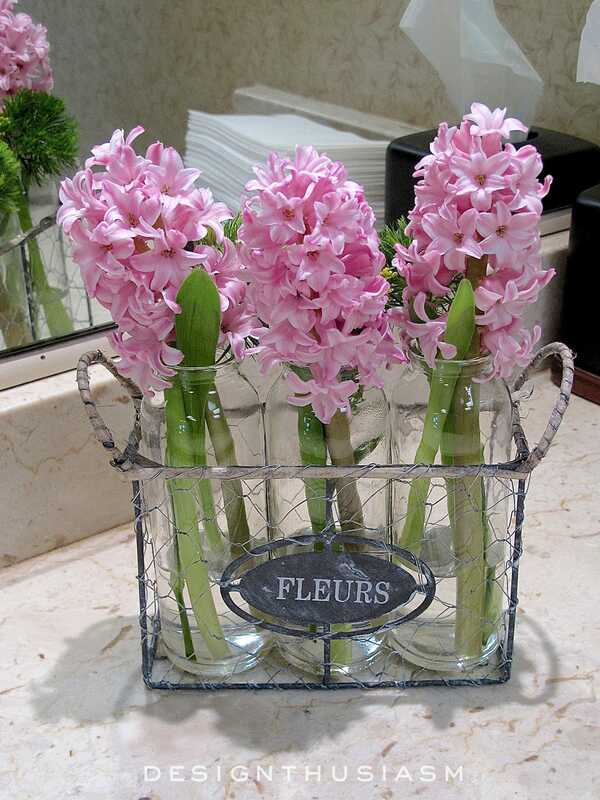 The square glass vase holds pink French kisses, all presented on a floral tray. 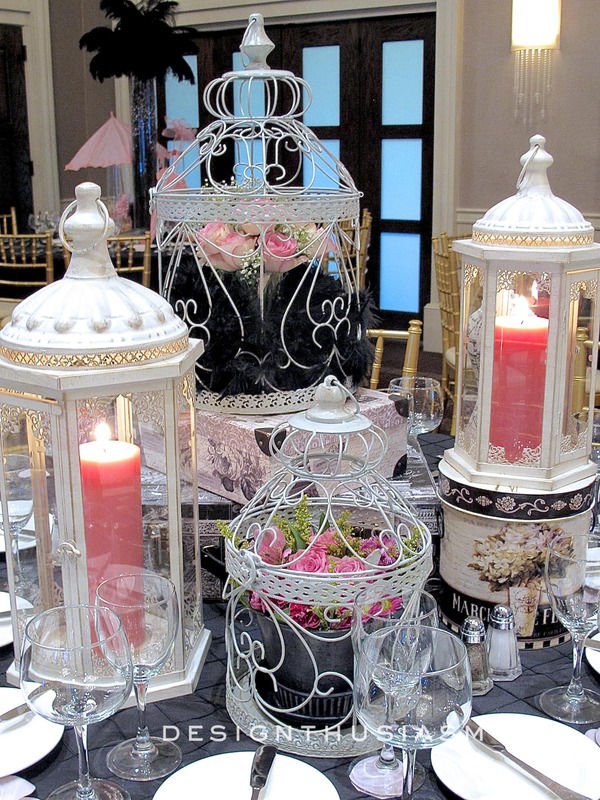 I was a big fan of the birdcage table, with candle bedecked lanterns and florals in the cages. 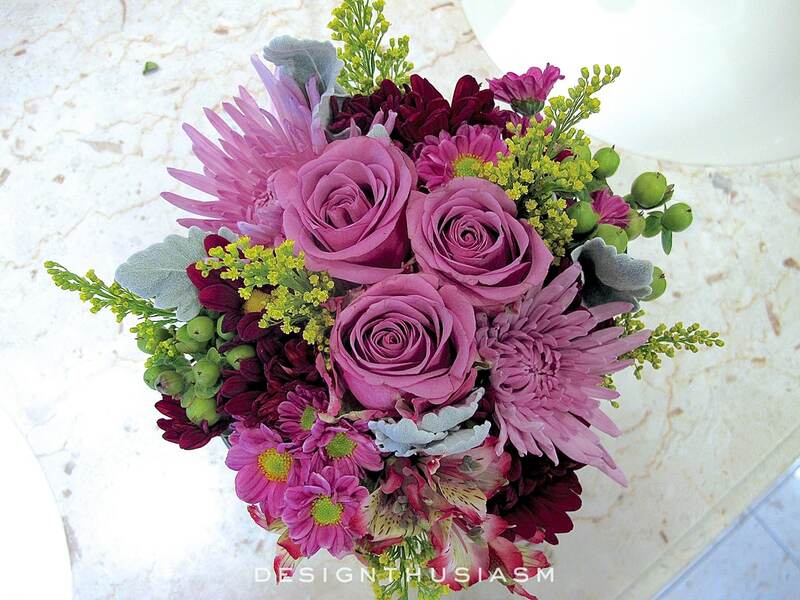 Placed on decorative boxes the multi level centerpiece offered a delightful vision of the springtime to come. 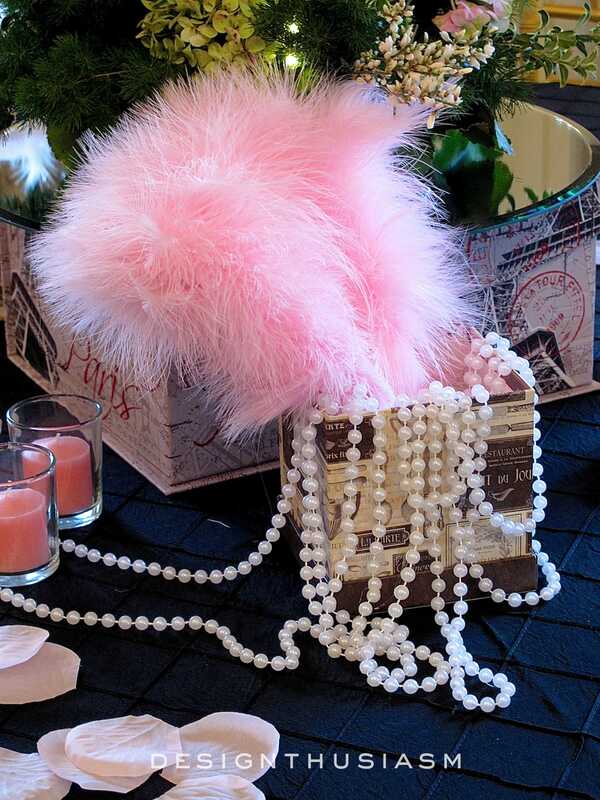 The pretty florals are wrapped in feather boas, a lovely way to serve up the pretty pinks. 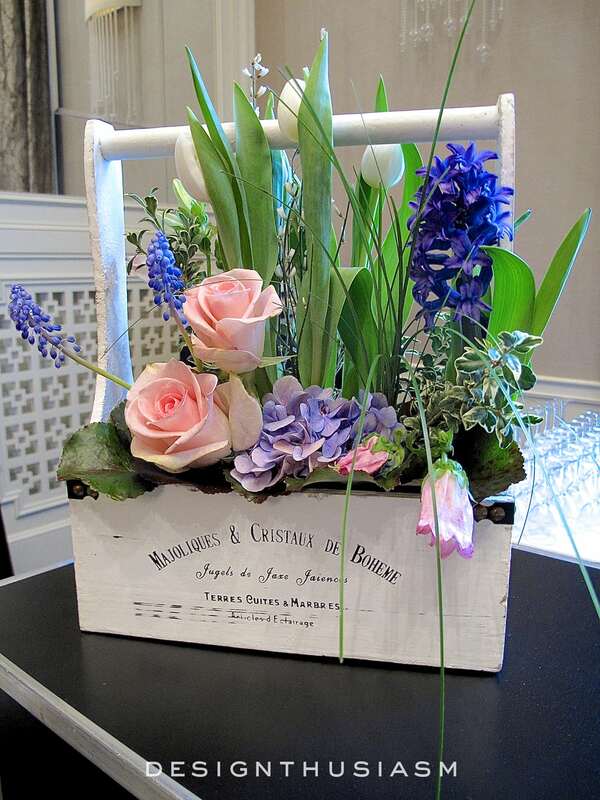 Flowers were also used to decorate the bar, with roses, hydrangea, hyacinth and more, all tucked away in a chippy French planter. 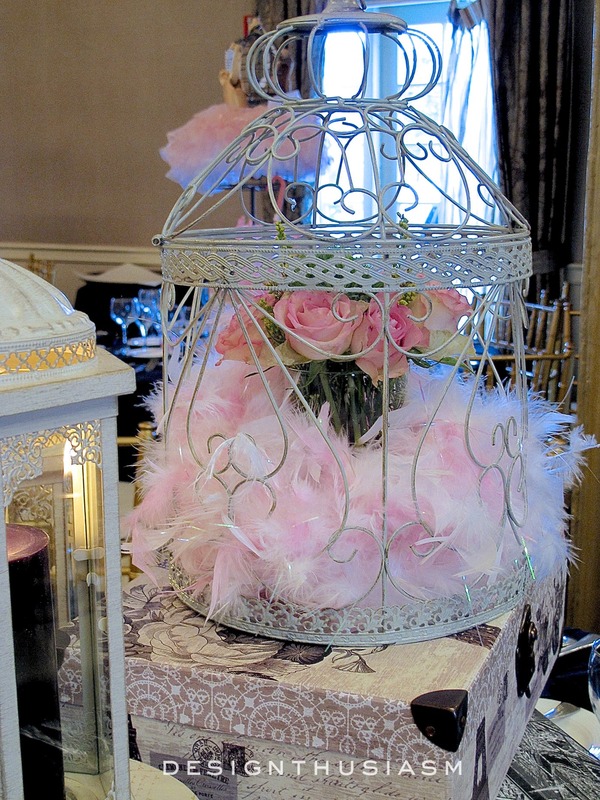 The feather theme was carried over to the other side of the room, in a very tall piece with beaded twigs inside. Parasols and flowers complete the package. 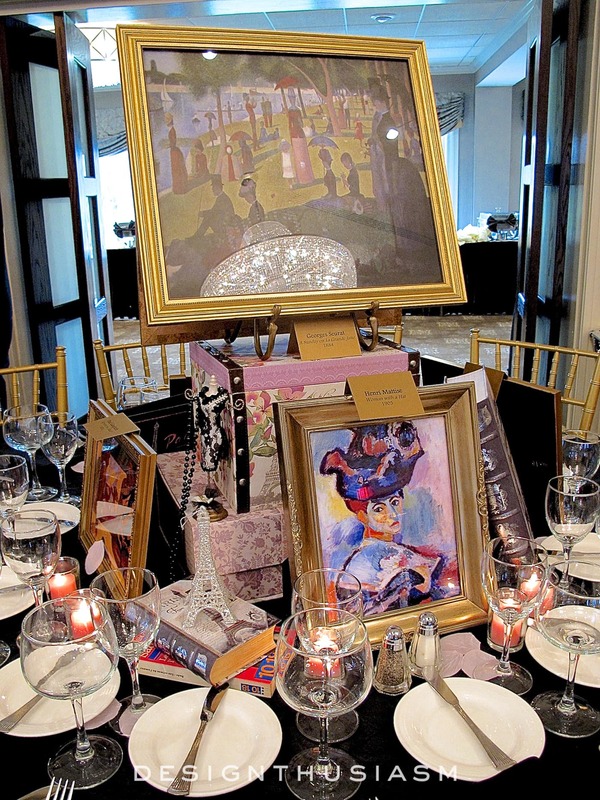 There were also a few centerpieces high in concept, serving up French art, as well as books and music. The paintings were labeled like museum pieces and people enjoyed walking around the table to see all that was there. 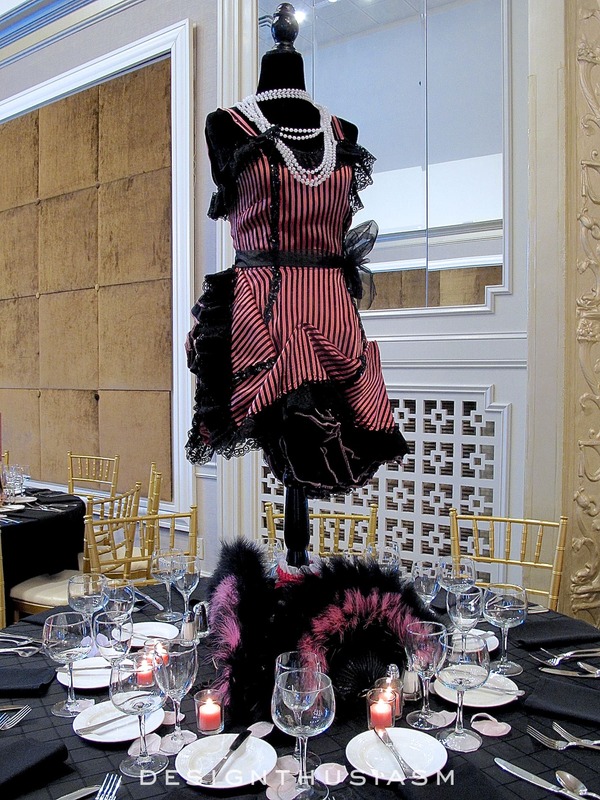 An additional mannequin was dressed as a can-can dancer, with feathered fans at the foot and pearls layered at the neck. 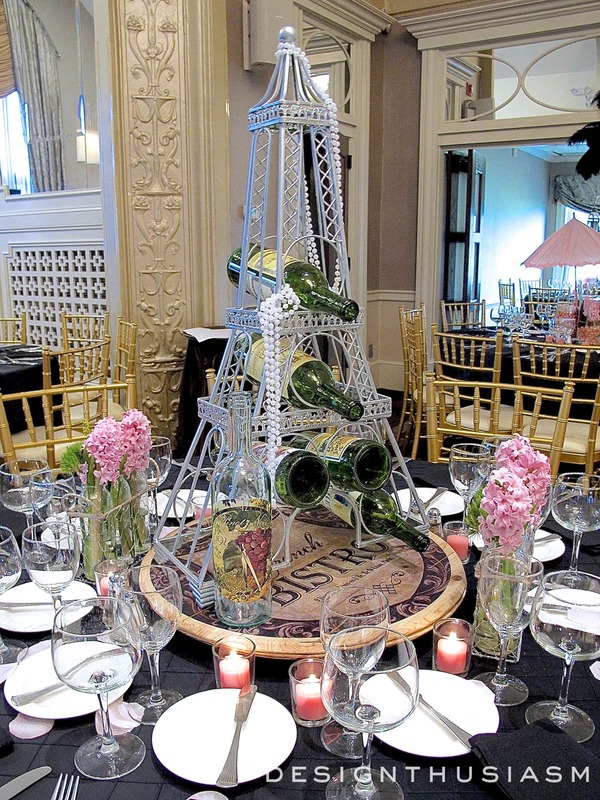 There were several tables that were adorned with string-lit Eiffel Towers with lush flowers at the base and French decorations flanking the centerpiece. 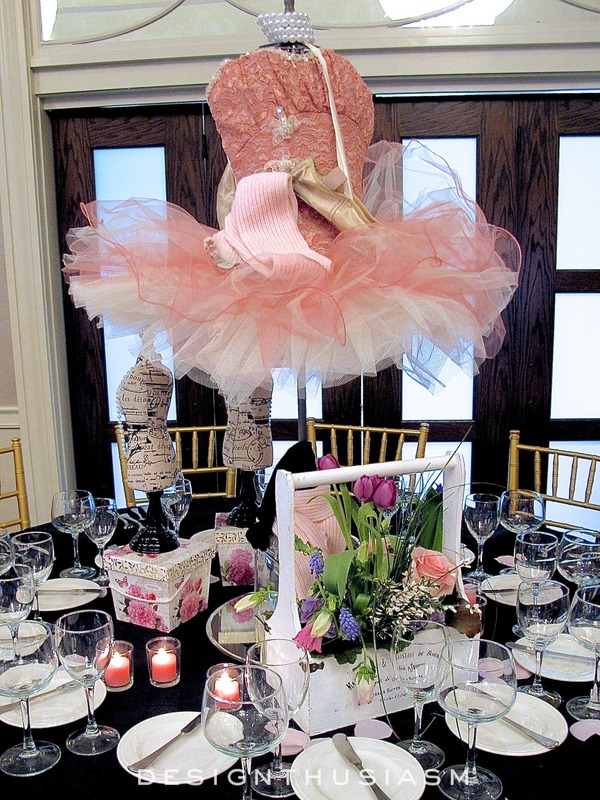 A second ballet dancer included leg warmers with the pointe shoes and a floral garden bucket graced the table. 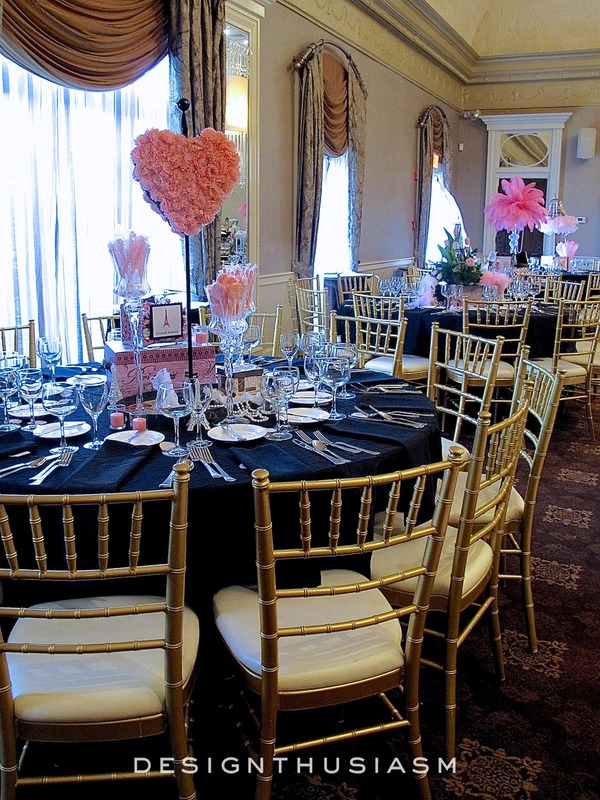 Tables were set in black and pink to work well with the unique centerpieces. Of course the rest rooms were adorned with lovely spring flowers, too. What a perfect time of year for a festive party! Thanks so much, Diana! Actually, my friend was the main talent behind this one, but it was a pleasure to work with her on it… 🙂 Everyone was quite pleased!! Thanks for stopping by! What a fun event and so beautifully and creatively done! I bet everyone loved it! I know I would have! 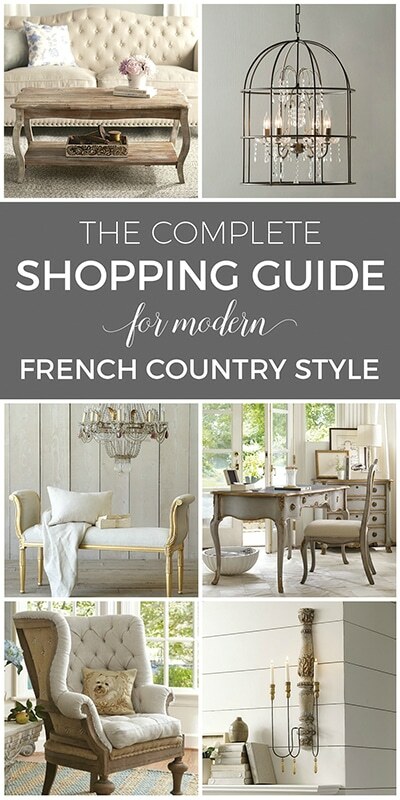 Everything is beautiful and I love that the Paris theme encompassed some many different aspects of Parisiene life. 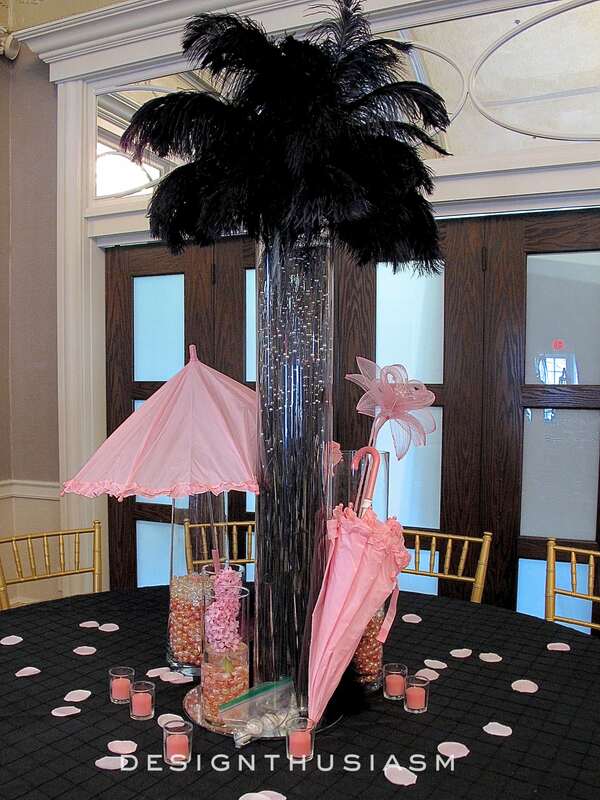 have the tables done by many different ladies in a particular theme and it is so much fun seeing all the different tables. Thanks for sharing this fun post Lory. Thanks, Nellie! Yes, thematic parties are fun to create… 🙂 I also love any of the pieces with the florals!! OH my! I think I would have a difficult time choosing a favorite among them. One table as beautiful as the other. I think I might pick the 2nd ballet dancer. Of course my favorite color is pink, my nickname is Pinky. I have a degree in fashion Design so the Mannequins pull at my heart strings. I also am pleased to see that you and your friend have an understanding of the lost art of table setting. So many people I meet don’t know the difference between a butter knife and a dinner knife. The event must have been a delight for all. Blessed Be. Thanks, Josephine! Not sure if you’ve ever read my bio but I worked as a fashion designer for 25 years… 🙂 That’s my “real job”. I stopped about 5 years ago. Thanks for visiting!! I just have to say I normally don’t reply to blogs. Even though I frequent them often! But I simply adore this! These are fantastic and do creative. Thanks for taking your time to create and share!!! 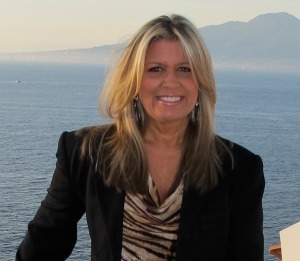 Thanks so much, Vickie! I’m so grateful you decided to comment, because that really makes my day… 🙂 Thank you for taking the time!! WOW!!! The decor for this event is so gorgeous and creative!! Thank you so much Lory for posting all of these! It was great to work with someone so creative and who shares my vision!! There couldn’t be a more beautiful post. Incredible details. I couldn’t pick a favorite. I loved your post and will look at it again. Thank you, Valerie! What a lovely thing to say… 🙂 Thanks for visiting!! What fun! These tablescapes are all so creative and pretty. I love all the varied designs, especially the use of the mannequins. Great job! I love this idea for a tablescape! Such fun ideas! Jaw dropping, stunning, exquisite and just plain old beautiful! What a delight it would be to see this in person! Aw, thanks so much, Sandra!! You always leave the best comments… 🙂 Thanks for stopping by!! 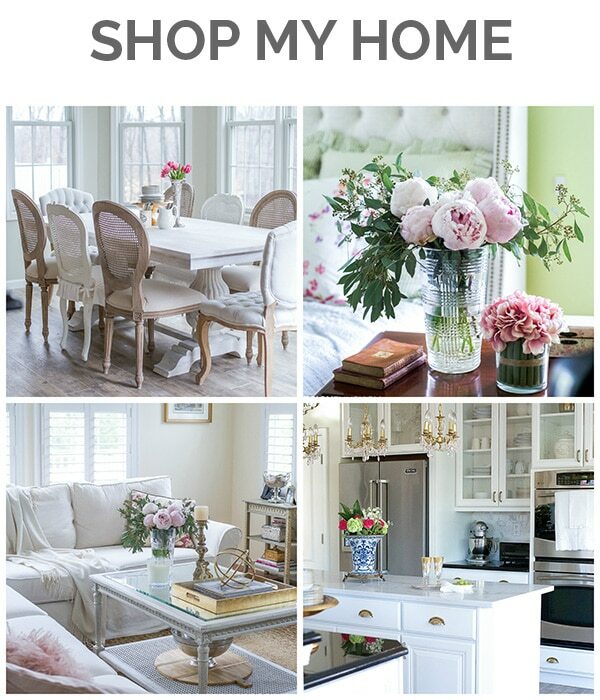 Beautiful gorgeous tablescapes! I loved every one! Must have been a lot of fun to put all that together. I would be hardpressed to pick a favorite, but I do love the closed umbrella one with the tulips. Good morning Lory from Canada’s Westcoat! Just loved your Parisian Tablescapes, I also styled my wedding and reception in Parisian themes including a 5 ft sparkling white Eiffel Tower in the center of the wedding cake and dessert table, It was a hit, however your tables are spectacular and the variety was amazing! Might have to stage my 5th anniversary party borrowing some of your ideas!